IGNIS ICO: What are your options? The IGNIS ICO starts soon and I see a lot of questions on what you should do during the ICO/Snapshot phase. I tried to summarize some scenarios on how to invest during the ICO and what the possible outcome after the snapshot in Oct/Nov will be. These scenarios also show you until when it is rational to participate in the ICO (maybe you do not have the chance in Round 1 or 2) or when is it better to wait for the snapshot. Let's start with the information we have on the ICO (from www.jelurida.com/ico). I took this information and calculated the total NXT which is going to be spent in each ICO round to calculate an average JLRDA price (in NXT) during the ICO. Then, we need a starting position. In this example we start with 100'000 NXT. I also use the NXT/USD rate (which is not important) and the average JLRDA price in NXT, calculated from the total JLRDA sold in each ICO round with the according price (e.g. 394'000'000/440'000'000). Now let me show you some possible scenarios on how to invest in the ICO. These are not all options you have, but some of the most common. Depending on which scenario you are following, you have a stock of NXT from which you spent a certain amount during the ICO phase (or you don't spent any, see scenario 1). Then you will see the total NXT you will have after the ICO rounds, which you will keep for the snapshot. You will also have the total amount of IGNIS either from the ICO or the snapshot. In the end, you can see the total value of your original 100'000 NXT investment either in NXT or USD. I recommend comparing the NXT, since the USD is always changing. In the above table you see the total amount of NXT (careful, this is your investment worth in NXT in the end) if you are holding all your NXT for the snapshot. Now, if you invest your NXT in ICO round 1, all scenarios will be at least as much worth as the snapshot participation scenario 1. Even scenario 2 and 5 in ICO round 2 are at least as much worth as the snapshot participation. All of these scenarios work only under the assumption that the JLRDA/IGNIS price in NXT is stable over time. As we know, this is not true. IGNIS could be worth more or less as the average NXT calculated here. But based on what you think where the IGNIS price in NXT will go you can decide which scenario is probably the best for you. P.S. 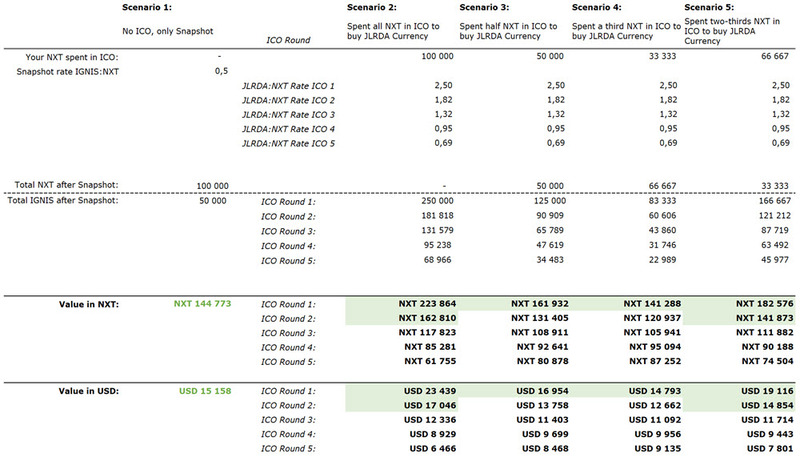 : In my opinion it is not important if the NXT price in USD drops after the ICO or not because I assume that the IGNIS price is connected to NXT and with these scenarios I only show you where your investment will go, valued in NXT (e.g. I will have more NXT then before). I hope I could clarify some things regarding the IGNIS ICO. I give no advice on what you should do. If you were a crytpo noob like myself and currently had 500 ARDR and 500 NXT in his wallet. What would be the most ideal scenario to wager on the new ICO? Getting conflicting info on whether to switch ARDR to NXT or hold it. I am not going to give advice but I can tell you what I am going to do. I am holding 50% of my NXT in Ardr ( like you), 40% in IGNIS then and the rest in NXT. is ardr being considered in the snapshot. i thought was only nxt. i hodl 25% ardr 75% nxt atm .. i cannot figure how to pull the coins out of polo. my test withdrawal gave me responce "please wait for (something?) to generate NXT code" .. wat ?? Use the NXT Desktop wallet, create account, SAVE passphrase (only access to account), then send NXT/Ardr to the NXT- address top left of your wallet. And no, Ardr is not considered. Only NXT. May I tweet your Post? I am still confused as to what to do, do I buy NXT to buy IGNIS or hold the NXT bag to get the free Ignis at snapshot.. it's all a gamble but I am sure I will figure it out.. Great post. Yes but it is likely that NXT is rising again before every ICO Round.